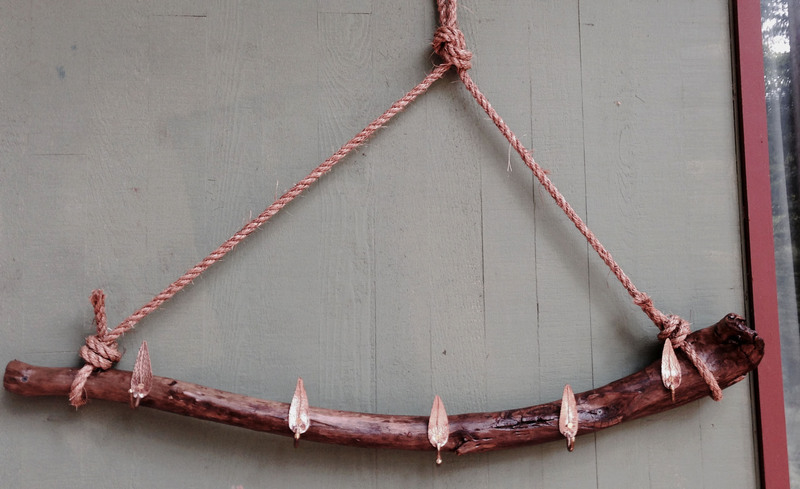 In mid-May, we received an order for five olive leaf hangers to be installed on a driftwood towel rack for outdoor use. After a brief correspondence to check on size, etc., I spent an enjoyable afternoon in our metal shop. Starting with a sheet of silicon bronze, I cut out the leaves with a metal band saw, ground the edges with a belt sander, textured the surface, soldered the hooks that I had previously cut and shaped, drilled and beveled the screw hole, and polished the finished hangers before mailing them off. Recently, I received an message from Justin with a picture of his completed towel rack. It’s beautiful! And since he used treated driftwood, this will be something that he’ll use for decades to come. Thanks for sharing the picture! This gate was built for a client who wanted a side-yard gate for back-yard access, It turned out beautifully and incorporates strength and security with a touch of nature. 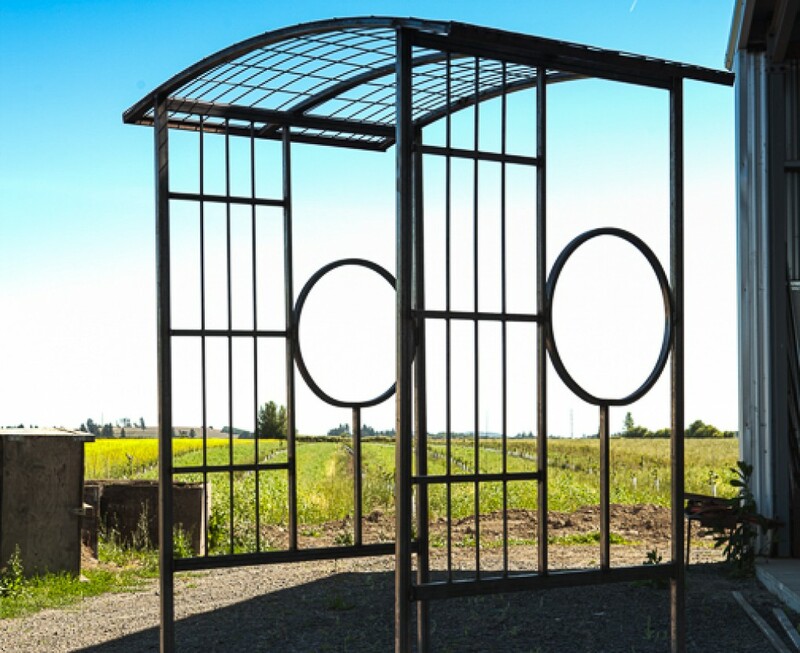 Inspired by Frank Lloyd Wright, this beautiful garden arbor will grace your yard for decades. It is waiting for your choice of paint color (included) and we can add decorative elements for an additional fee. Matching fence or railing available. Outside footprint is 52×59 inches. Approximately 8 feet tall at sides – can cut to fit your height requirement. $1500. 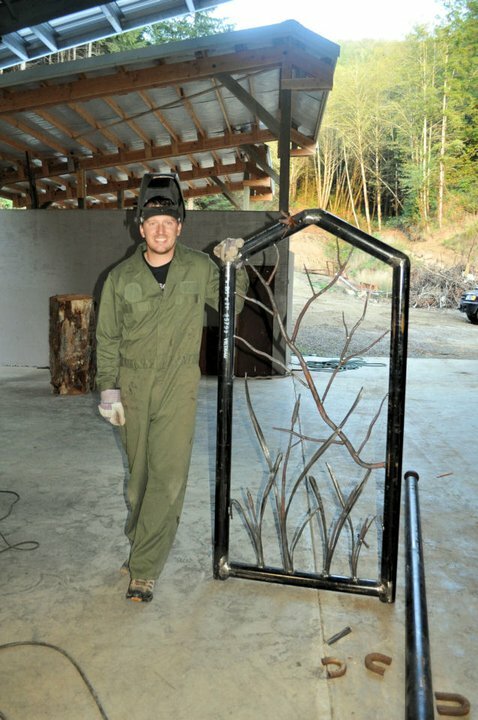 Ted’s favorite gates incorporate cattails and reeds into a structurally strong frame. This gate was commissioned for a private residence on the south coast. 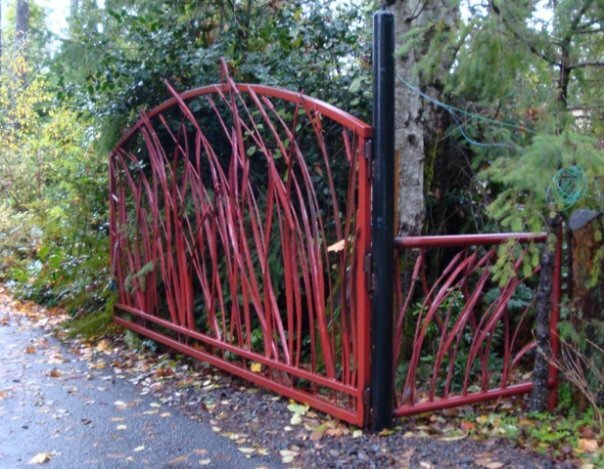 Side panels were built to accompany a swinging curved driveway gate. 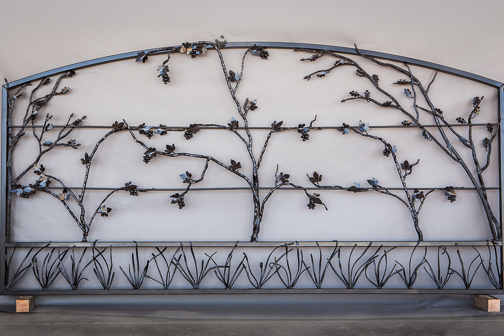 This beautiful gate incorporates oak branches on either side of a grapevine, complete with grape clusters and leaves. It is forged out of steel to secure your property with strength. It truly is a one-of-a-kind masterpiece. $4,500. These vessels bring the natural world into your home with a permanence that will last for generations. 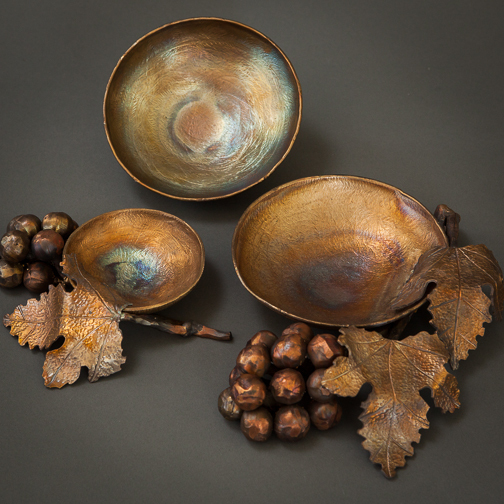 Hand-forged out of rich bronze, the bowls nestle into a olive branch, grape cluster, or oak leaves with acorns. Flashing the finished bowl with a torch brings out a rainbow of colors on the metal. Prices range from $40 for a small plain bowl with no ornamentation to $200 for a custom medium-sized bowl with a number of decorative elements.